iMovie is a popular and easy-to-use video editing app for Mac and iOS apps. With it, you can turn your videos into eye-catching movies in clicks! However, if you want to import DVD to iMovie (iMovie 11 included) for editing, you'll be disappointed since iMovie only accepts MPEG-2, AVCHD, DV-Standard, HDV (High Definition Video), QuickTime Movie and MEPG-4 formats while DVD is not supported. Previously, you can try to create an disk image file with VOB files by using Disk Utility and then import .dmg image to iMovie as camera. Actually, that is a workaround. But it doesn't work anymore. To edit DVD files in iMovie (no matter iMovie HD, iMovie 08, iMovie 09, or iMovie 11), you have to convert DVD to iMovie friendly format first. To rip the videos from DVD to iMovie compatible formats, EaseFab best DVD Ripper mac will be a great help. It lets you convert DVD to iMovie in a few clicks. An iMovie preset is included for easy access. Now download the program and follow the guide to convert DVD files to iMovie format. Insert the DVD disc you want to convert into your Mac's hard drive and click "Load DVD" to import the DVD movies. Or simply drag the DVD disc icon on the desktop to the program. Loaded DVD movies can be previewed in the right preview window and you're free to take snapshots of your favorite DVD movies. In addition, you can select the subtitle and audio track as you like. Next, choose an output format for iMovie. Click the Profile bar to open the format list. 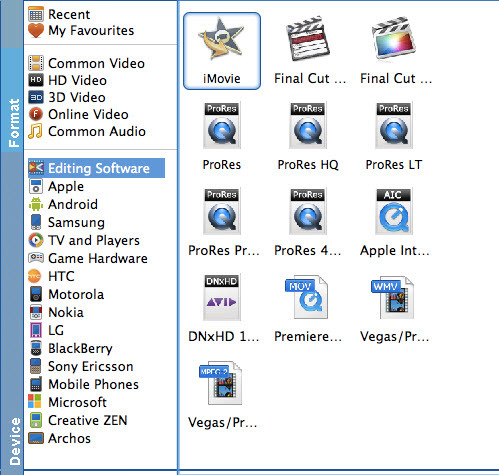 Then go to "Editing Software" and select "iMovie" as the output format to get videos with optimized settings for FCP. As you see, besides converting DVDs for iMovie, this DVD ripper for Mac OS can also help you convert DVD to Final Cut Pro, Final Cut Express, Avid, Premiere Pro, etc. or directly convert your DVD movies to the format for your iPhone, iPod, iPad, and more. After all the settings, click the Convert button to start converting DVD to iMovie supported video format. A few minutes later, you'll get the converted videos. Finally, launch iMovie. In iMovie, go to the File menu, choose Import > Movies, and then navigate to the folder that your output converted AIC MOV files are saved. Select the files and click "Import".